Spider-Geddon descends upon the Fantasy Comic League in October. 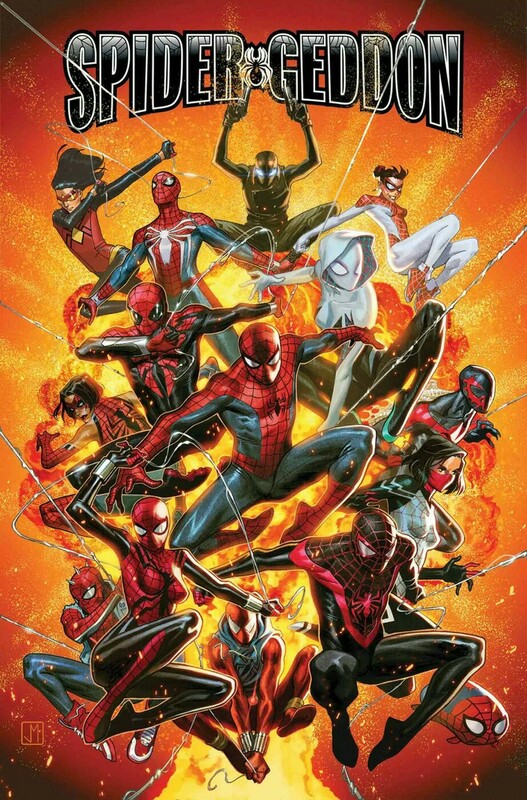 The sequel to 2015’s ambitious Spider-Verse event assembles the Spider-heroes once more to face the threat of the Inheritors. While the Spider-Ban keeps the main Peter Parker out of the fray for most of the divisions, there is no lack of spider characters available for drafting. For the purpose of estimating appearances, Miles Morales, Spider-Gwen and the Superior Octopus seem to be the biggest players in the event outside of the original Spider-Man. Apart from the main event title, several tie-in books focus on different parties of spiders. Spider-Force features Kaine Parker and Jessica Drew, two characters with the potential to be big players and appear in at least two books. Three young Spider-Girls, Anya Corazon, Mayday Parker and Annie May Parker, star in the aptly titled Spider-Girls, but they represent a bigger gamble as their overall participation in the event is anything but guaranteed. Vault of Spiders, the third tie-in series, shows a smorgasbord of spiders on its cover, but it’s anybody’s guess which characters will appear within its pages. The Avengers remain reliable draft picks into the month of October. They have only one issue dropping in the five-week month, but their solo titles combined with a cameo appearance in Immortal Hulk boost their numbers. Several of the Avengers, such as She-Hulk and Black Panther, join the recently returned Fantastic Four in their latest book. Black Panther gets an additional advantage when he becomes the latest hero to confront Deadpool in a limited series battle, Black Panther vs. Deadpool. The X-Men’s fortunes are not as promising after the conclusion of their main titles, X-Men: Blue and X-Men: Gold. The mutants on the X-Men: Red roster remain somewhat decent picks, while the X-Villains take center stage in the spooky month of Halloween. The weekly X-Men: Black series stars a different antagonist with Mystique and Emma Frost standing out with at least two estimated appearances each. Other books of note are the new titles for Shatterstar, Iron Fist’s digital exclusive, Venom’s first ever Annual, the return of the Unstoppable Wasp and the start of Shuri’s own title after her breakout performance in the Black Panther film. Infinity Wars continues, but the main title and its tie-ins star the warped heroes of Gamora’s perverted Soul Gem world. The return of the What If? series feature alternate versions of Spider-Man, the X-Men, Ghost Rider and Thor so would not be counted for our main characters. Other dopplegangers of our main characters are found in Marvel Zombie, Marvel Super Hero Adventures: Captain Marvel – Halloween Spooktacular and Old Man Hawkeye (with the exception of Old Man Logan if he appears).